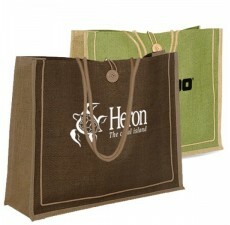 These durable and water resistant Jute Promotional Explorer Totes are strong and eco-friendly. Jute is one nature's most versatile natural fibers and these bags will prove that time and time again on shopping and grocery store trips. Show your customers you're committed to saving the environment and saving them money. With more grocery stores charging for plastic bags these jute bags will steal the show. With a large 10" W x 5.5" H imprint area your logo and slogan can stand out for the world to see.